Evangelical Christianity is losing ground in general in North America. A Study by Gallup in 2008 showed that those who identified with Christianity had steadily declined over the past 30 years at the time. The trend continues with recent Gallup data from 2017 stating that 48.5% of Americans identify as Christians. 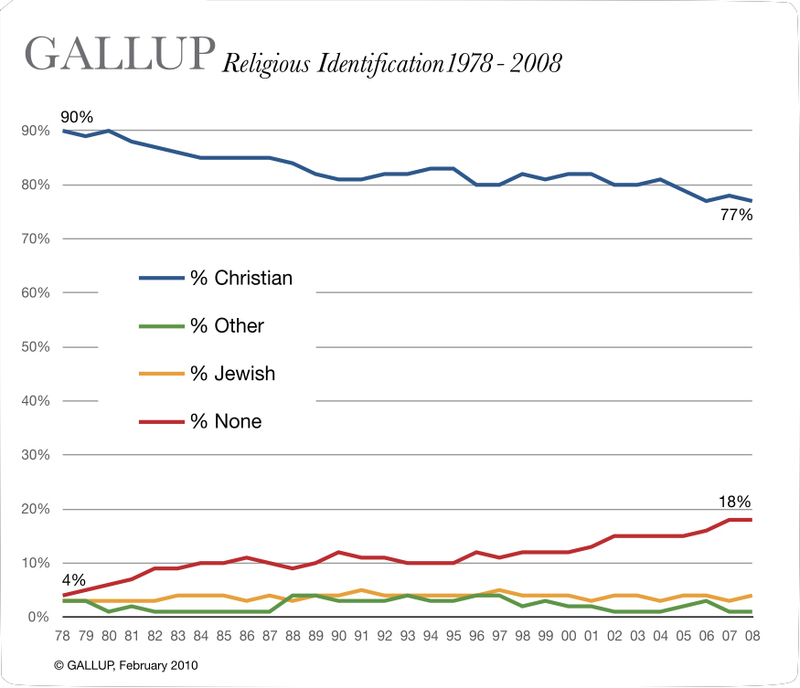 In that same time the "Nones" (those who identify with no faith) has steadily increased and sits at 21.3%, as of 2017 (gallup.com). 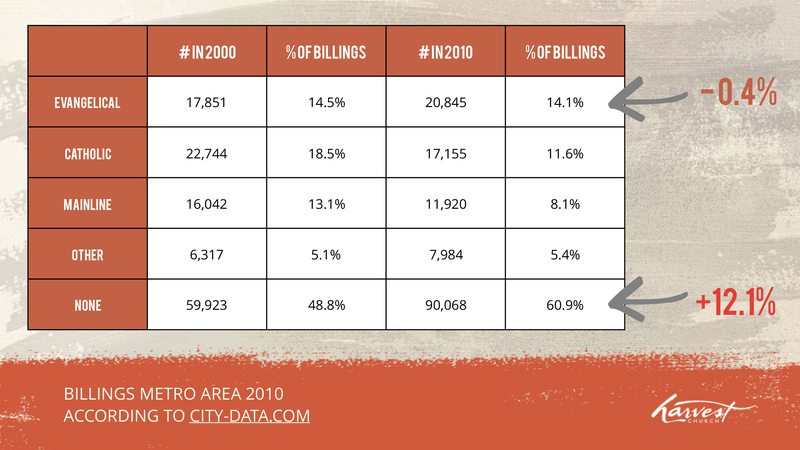 In Billings specifically, from the most recent US Census data, Evangelical Christianity has declined 0.4% from 2000 to 2010 with approximately 21,000 while the "Nones" have increased 12.1% and now sits over 90,000 (City-Data.com). Unfortunately, this decline is consistent at Harvest as well. For the past 14 years, we have lost ground as a church. 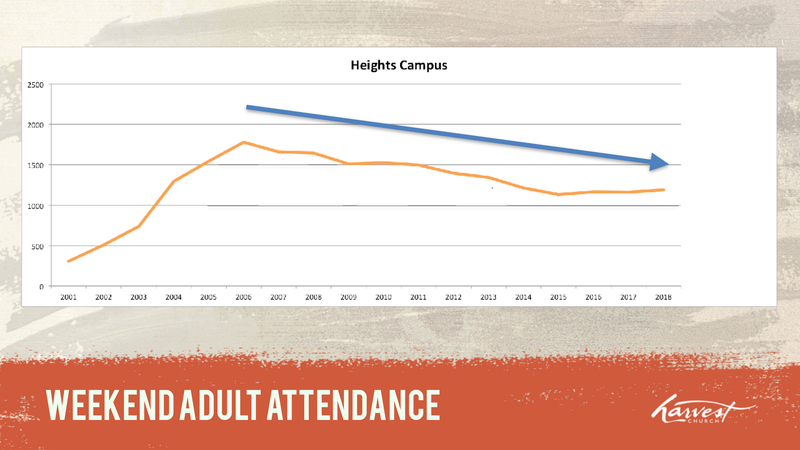 Harvest weekend attendance in Billings has consistently declined or plateaued for the past 14 years. That's the bad news. The good news is that the changes we have been making are producing fruit. The specific change many of you have experienced is that we have moved to a "relational shepherding" leadership model. This change focuses on effectiveness over efficiency in relationships with one another to encourage each other to take a next step in our faith and relationship to God. While the staff has been working on this for months, we publicly implemented this shepherding model on September 9, 2018. From then until the past few weekends, we have seen a 3% increase in adult attendance at our Saturday 5 PM service, a 10% increase at our Sunday 9 AM service, and a 19% increase at our Sunday 11 AM service. This growth is great, but it also brings with it growing pains that need to be addressed. We are beginning to run out of space in our weekend worship space, specifically on Sunday mornings. Our 11 AM service has been as high as 93% capacity and 88% capacity the following weekend in November (at 80% we begin to see negative impact to attendance). We need to create more space in our adult worship environment, especially around the 10:00 am -11:00 am period as this is the prime window people who aren't connected with a church look to attend. While we are reaching consistent space issues in our adult environment, we already have an issue in our Kids space. 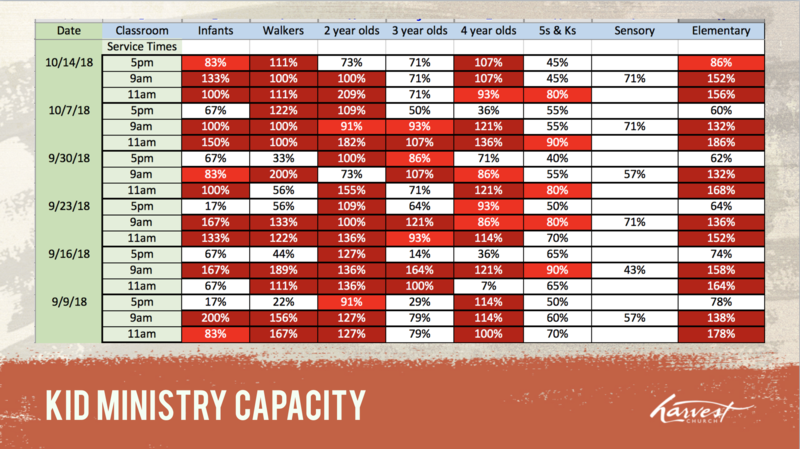 The chart above shows the capacity of kids for the 6 weeks up to October 14th. Red is 80%-100% capacity. Dark red is over 100% capacity. This is based on number of kids and adults per state guidelines. But that's not the only issue. We believe that the very best thing for you at Harvest is to be shepherded to your next step to Full Surrender. Ideally, you're able to attend worship regularly, be in a small group 2 times a month, and serve inside Harvest 1 time a month (Vern will be preaching on this in detail in January). For those of you who attend Saturday night, we realize there is a problem facilitating your next step to serve as there is no "serve one, attend one" cadence with Saturday worship services like there are with Sunday. Compared to the Sunday attenders, Saturday has 50% less people who are in worship, serve monthly, and give regularly (groups isn't included here as that happens other times during the week). The logical answer is well, let's add a Saturday service! The problem with that is that people who are not church goers want to come on Sundays, not Saturdays. 91% of 1st time guests are coming on a Sunday ... and if they have kids, they are dropping them off, in some cases, to rooms that are at 200% capacity! We've got to do a better job of caring for our church staff as well. We recently received the results of our staff engagement survey from Best Christian Workplaces Institute (we will report on those results soon). One of the areas we declined over last year was "helping [our staff] maintain work/life balance." The energy needed by the church staff and volunteer leaders to start Saturday services compared to adding additional Sunday services is significantly more on Saturday night. As an example, our worship and tech teams arrive on Saturdays between noon and 1 pm to prepare for a 5 pm service, and leave around 7:30 pm. Additionally, our shift to a relational shepherding leadership model is requiring more time during the week for ministry. Making the shift to Sunday services enables our staff and key volunteers to have two days off in a row to rest and recover from the week in preparation for weekend services. Ultimately, we need to add capacity in kids ministry now and prepare to add worship capacity soon on Sunday mornings. The first step of that process is to align the effort, leadership, energy, and focus from our Saturday night service to Sunday mornings, in preparation to eventually add a 4th Sunday morning service. We will start the new service times on Sunday, January 6. If you have questions or would like to voice any thoughts or concern, please email the Church Council at council@harvestchurch.tv. You are also invited to a meeting after the Saturday service on December 15, 2018 (If you have children in Kids Ministry, you will just pick them up after the meeting).